Last week I polled the SF Bluestocking readership to see what my Let’s Read! 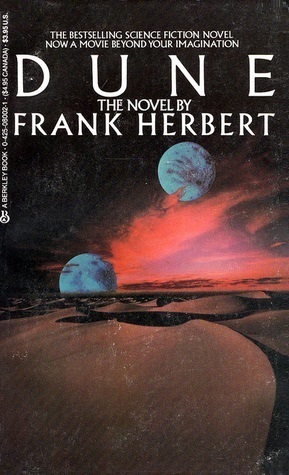 Project would be for the month of May, and Frank Herbert’s Dune is the book that came out on top, and pretty handily. Dune is a novel that has been on my to-read list for literally years, but it’s also a book that I know very little about outside of the expected nerd culture references that it’s impossible to be into SFF and not have come across. I know it’s a book that has been heavily influential for both sci-fi and fantasy; I know that it takes place on a desert planet; I know that David Lynch did the movie back in 1984 (though I’ve never seen it in spite of having seen most of Lynch’s other work); and I know that it has sand worms in it, but only because I looked it up when it was referenced in that Fatboy Slim song that came out when I was in high school. I haven’t read any reviews of the book or movie, and having not read the book, I also haven’t done more than skim any of the many pieces about the book and its legacy that were published in the year of its 50th anniversary. All in all, I’d say I’m coming into this about as entirely unspoiled as one can for a highly popular and widely read and referenced book that’s over half a century old. Which is kind of cool. I’m usually not even this unspoiled when I read new releases, just because of the sheer amount of advance reviews and promotion that is the standard these days. My copy of Dune is the 1984 movie tie-in mass market (ISBN: 0425080021), if you care about reading the exact same edition. There are no extras that I know of, though it does have several appendices that look like they will be useful. The text of this edition, not including the appendices, is 489 pages long. There don’t seem to be actual chapters, though there are often breaks in text with epigraphs that break things up (I’m guessing) like chapters. I plan to finish reading and writing about Dune by the end of the month, so I have broken it up into twelve sections, each one approximately 40 pages, though a couple are longer or shorter. I will be sure to include in each post the exact pages of what I’m covering. As of right now, my goal is to get through three to four sections each week, with the first post appearing tomorrow, May 5. Finally, I’m going to cap off the project with a Dune movie night on Saturday, May 25, with cheap wine and livetweeting and a blog post about the film the next day. Updated to add: I may do a double movie night and watch the 1984 film and 2000 TV mini-series back to back, or perhaps do one on Friday and one on Saturday. I’ve been advised that I should actually watch the later adaptation first either way, however. In any case, I will have more details on that closer to the end of the project, and I’m open to suggestions for how I should do this thing. I’m pretty excited about this book. I’ve been sort of systematically (albeit slowly) working through some SFF classics over the last couple of years, and this one is obviously pretty essential reading, if only for academic reasons. In any case, I’m finally going to find out what I’ve been missing out on all these years. I’ve never read Dune either (and consistently feel embarrassed about it because everyone seems to agree it’s one of the seminal SFF works). I’m glad I’m not the only one! Seeing you start reading it is motivating me though. Maybe I’ll try to pick up a copy and read along as you post. Could be fun!